I started tracing my Early 86 Black Stripe over the weekend as I feel it would be good to have a verified III schematic out there if anyone is interested. 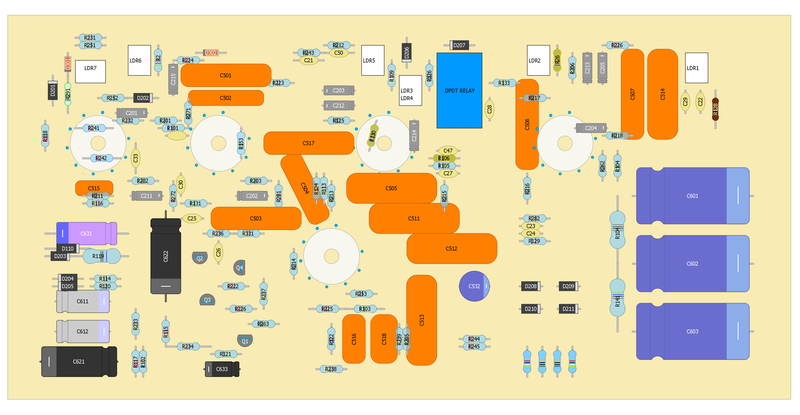 It'll be as a TinyCAD file and I would love for people to copy it and use it as a basis for getting some verified schematics of the different stripe versions for diagnostics/repair/mods. On a lot of the disc capacitors they are labelled, for example, 250K, 750K etc . If you type this into a capacitor calculator it comes out as 25pF, 75pF and 50pF at 10%. 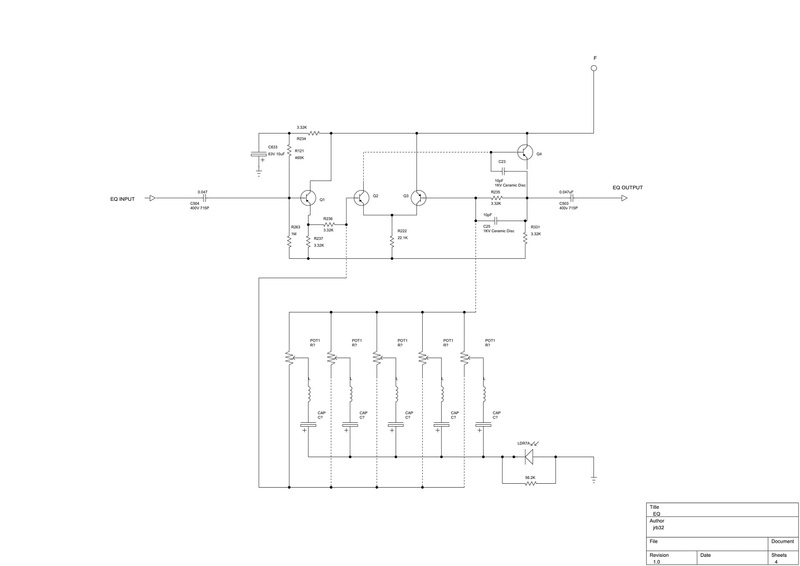 However, on the schematic these are listed as 250pF and 750pF, for example in the tone stack. 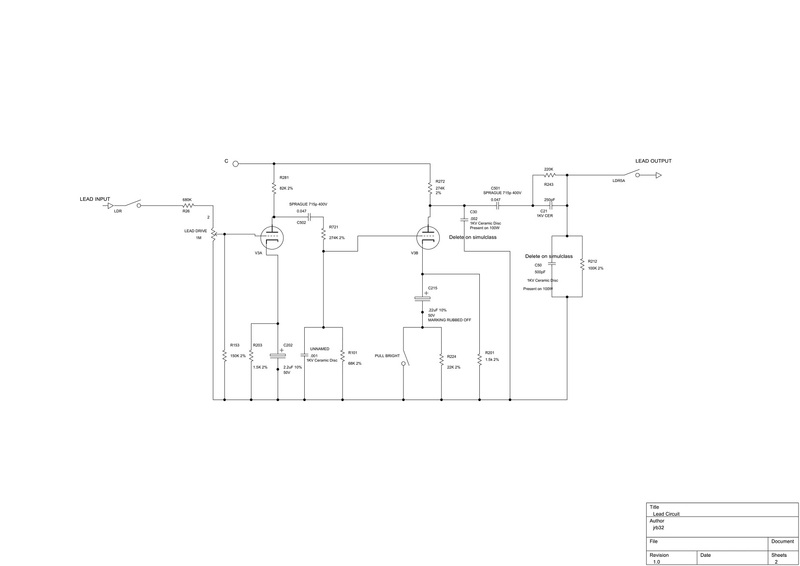 250pF 10% would be code 251K so I just wanted to check if there wasn't some different naming scheme in the 80s when it came to this, as every schematic I can find always lists these as 250pF, 750pF and 500pF so I'm probably wrong here but just wanted to double check as another disc capacitor for the pull bright is labelled as 181K 1KV which is using the correct code for 180pF which roughly matches the 100pF listed on the original schematic. Something to be wary of when tracing these things! Anyway I'll continue on my schematic. Last edited by jrb32 on Tue Apr 10, 2018 4:55 am, edited 1 time in total. - the resistor in parallel with the lead drive pot is 470k instead of 150k, which would provide for a bit more bass at higher settings. I think the 150k is actually beneficial as it tames bass before the overdrive. It also cuts the available overdrive a bit but the amp has plenty anyway. - the 120pf cap in parallel of the 470k resistor (either going to ground or the cathode of V3a) is missing - that would make the amp a lot brighter. 47pf is a good compromise. 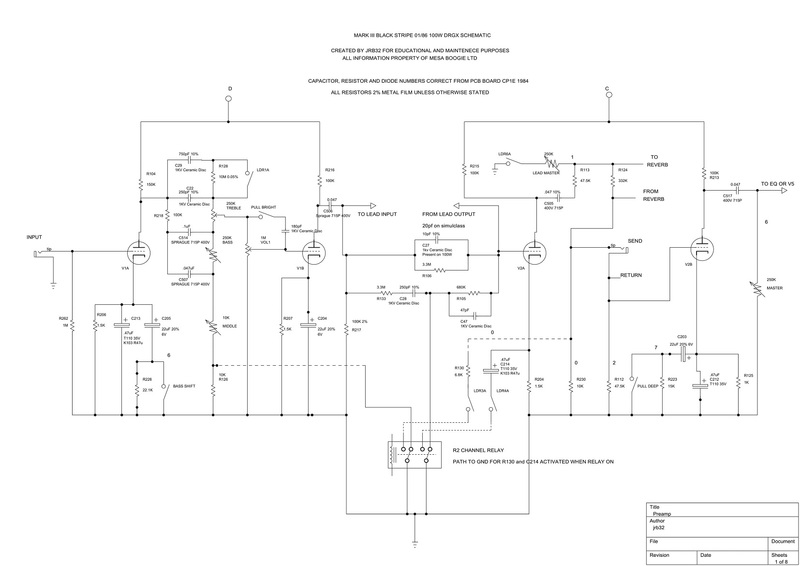 - C502 is a 0.022uf in my amp and all other schematics I have seen. 0.047uf would give more bass - not a good thing at this spot IMHO. 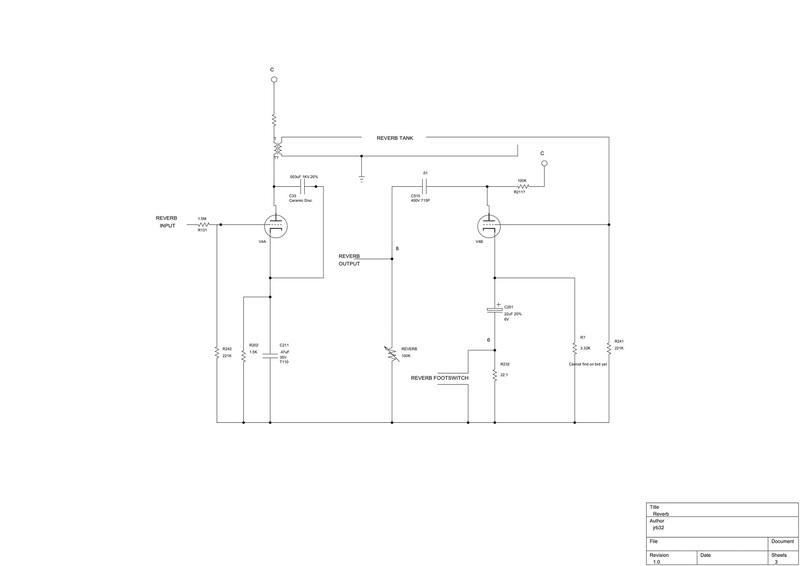 - R201 is a 3k3 in my amp and all other schematics I have seen. 1k5 would give more gain - not really necessary. - C30 was also 0.002uf in my amp. I changed it to 0.001uf as in the Mark II C+, which made the amp a bit brighter and more open. I also have no idea yet how the R2 circuit relay works so that is a bit blank at the moment. I've traced what I can for the moment for the R2 circuit but will do this fully soon. Last edited by jrb32 on Tue Apr 10, 2018 5:54 am, edited 8 times in total. Thanks for your great work. 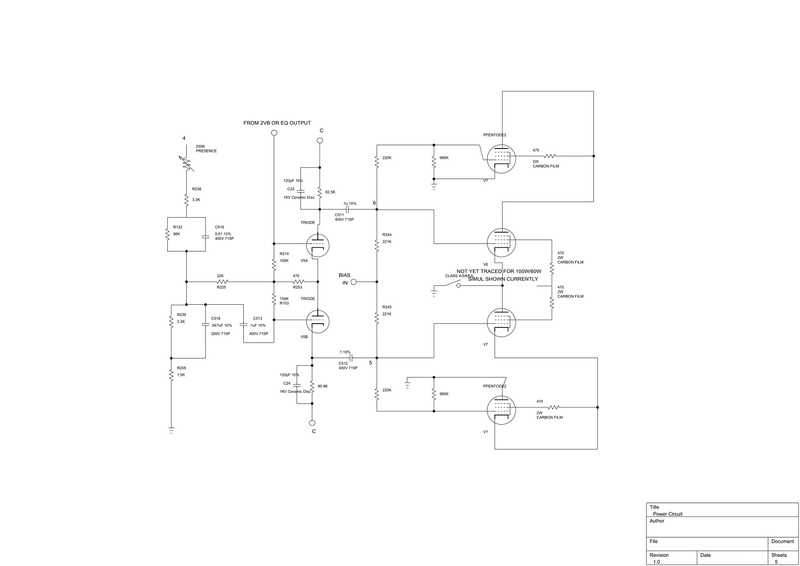 Can you please upload one schematic as standard pdf-file? I have difficulties downloading it. Last edited by jrb32 on Wed Apr 11, 2018 7:14 am, edited 1 time in total. Full III Black Stripe schematic for you guys! This has taken ages sorry for the delay. (well about 95% done technically! Some final things to finish off and double check) Everything with a R, C or D, LDR etc number has been verified and traced by me. This includes LDR supply, EQ etc and should give you an idea about how things work exactly! I also finally understand how the R2 circuit works! Hooray! It finally gives a good understanding of how the R2 circuit works. Then we can get a nice single schematic that shows pretty much all the differences between the stripe versions. This is similar to what Lions has been doing on here so full credit to him for this idea. Nice. Thanks for sharing ! 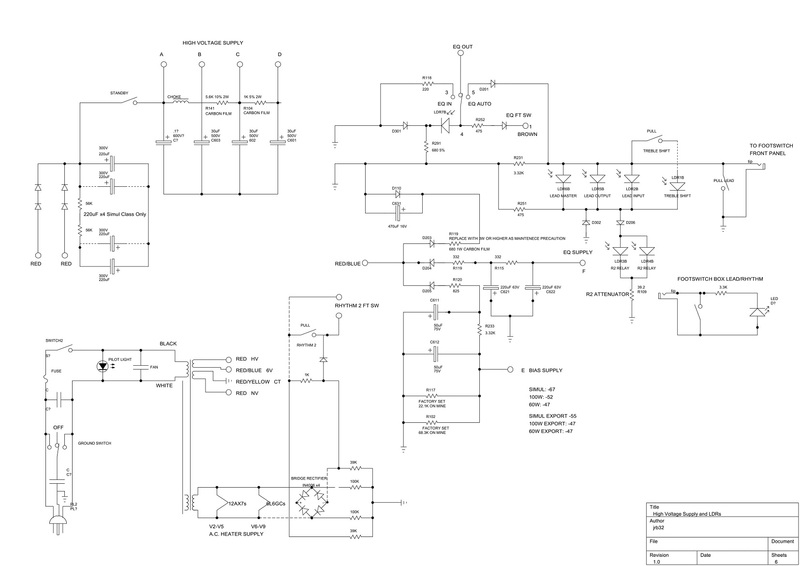 Do we have a legible IIC+ schematic we could compare this to? This is the closest you're gonna get until I can hand trace some IIC+s, which in the UK are super rare! This was from a LOT of research. Enjoy! Last edited by jrb32 on Wed Jan 30, 2019 10:12 am, edited 1 time in total. I'm this close to buying a very early export/Simul No Stripe, but I'm wondering if I should hold out for a C+. My amp was made in Jan 86 just before the purple stripes and was a kind of weird hybrid amp between the two. So the schematic for an early black dot and the CP1D black stripes are different to the one I traced for a CP1E board and the instructions would be different as well. The purple still uses the CP1E board but with different component values. Overall they're all fairly similar though with the main difference in them being the R2 channel which I never use so I turned it into a +/++ switch. Try the amp out first. If it blows you away then buy it. If not, and nothing's broken, then no amount of modding will get it to sound the way you want and get a IIC+ instead. Check the date code on the transformers as well on the III - the earlier the better. My 1986 has '85 and '82 power and output transformers! Wow, I looked at that table...Jesus Christ that's some work you've put into that amp. Incredible really. The amp I'm looking at is interstate, so I'd have to buy it first, which I'm hesitant about a little. It has a tiny little vertical black line above the power cord and Pull Rhythm 2 is hand engraved above the Middle Knob. I'm tempted to get the thing and try those handful of mods you mentioned to change the preamp - the seller says it has an old IIc+ output transformer and the serial is 1562X. Maybe changing that preamp would give me basically a 3 channel IIC+. Imagine it! It's a combo with no speaker, but I have an EVM12L here. Mainly I'd be running it into my old late 70's/early 80's straight front Marshall cab with old Greenbacks and my Soldano SLO cab with UK Creamback 75's. I just had Mike B. do the lll+ mod to my Mark lll DRG with an x101 transformer. The amp sounds and feels awesome. I consider it a 3 channel c+. I’m not going to argue with anyone whether it’s a c+ or not. It’s close enough that I don’t think I would miss my c+’s if I didn’t have them.